Starting at Quakers Yard, until the 18th Century, known as Rhyd y Grug, ‘the ford of the rustling waters’, where the Bargoed Taff and Taff rivers meet. Its name changed when land was bequeathed to the Quaker movement for use as a burial ground or yard. Until the 2nd half of the 19th century it was a picturesque rural village with 2 inns and little industry. Neighbouring communities developed later around the coal trade, local streets are named after influential Quakers and Treharris is named after William Harris, who came from a rich Quaker family. Travelling east we walked alongside a turbulent river taking us to the Taff Bargoed Park, built on the site of old mine workings. The river has been dammed to create lakes, providing habitat for a diverse range of insects, birds and small mammals. The manmade channels carrying water through the park were churning after heavy rain and occasional waves rose along the sides of the structures. Paving on the main footpath indicates the position of coal seams, each over 2000ft deep. Leaving the park and walking up a hill we noted that even the road had fast flowing water and we were lucky it was not icy. On reaching the outskirts of Trelewis we headed northwest across open land. We spotted a large herd of horses in the distance (redolent of a scene from an old western film). Continuing we came upon the site of the remains of an old chapel at Cefn Merthyr – hardly visible in undergrowth. There was a murky view to the west, of a green and brown hillside but looking north towards Merthyr a watery sunshine which we called ‘the promised land’ – it was so long since we’d seen sunshine. Reaching the eastern edge of a woodland, we continued north for a while before turning south through the wood. It was quite atmospheric, the trees being covered in moss and the clouds low. Moving closer to the edge of the track to peer into the wood we were staggered to see a huge tyre dump. Coming out of the wood, Aberfan came into view across the valley and we stopped for lunch. Continuing in a southerly direction we entered the Pontygwaith Nature reserve and the Taff trail at ‘Trevithick’s Trail’ which follows the old tram road from Penydarren to Abercynon along the river. The tramroad is famous for being the first in history to carry a full load of iron and passengers. On 21st February 1804 the train travelled 9.5 miles in 4hrs 5mins! Sleepers buckled and split with the weight and the engine’s boiler broke on the return journey to Abercynon. Looking west across the valley, the gap in the hill which is known as ‘the dinosaur’s footprint’ is visible here. Tram road stones for the railway are still clear on the ground in places. 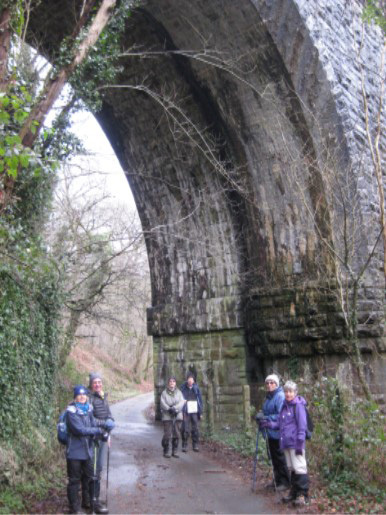 Soon we reached the magnificent viaduct which crosses the river Taff. It has double arches which were built separately but now form a single structure enabling 2-way traffic. Continuing down the trail we came to Quakers Yard station and from there returned to the cars. We agreed that, despite a cold, grey, winter’s day we had enjoyed a good walk with the bonus of being on proper tracks the whole way – much appreciated after heavy rain and the amount of mud around. The walk was 7¾miles and 800ft ascent. Map 166. Last June we parked at Coelbren and walked south towards Banwen. Local tradition claims that St Patrick, patron saint of Ireland (and patron saint of Nigeria), was born here. He engineered the development of arts and crafts after he introduced the use of lime and mortar to Ireland. Enabling the initial construction of clay churches in 5thC AD, he taught the Irish to build arches of lime and mortar instead of dry masonry – this developed into organised crafts. Just beyond Banwen a raised path crosses a boggy field and leads to a wetland area. 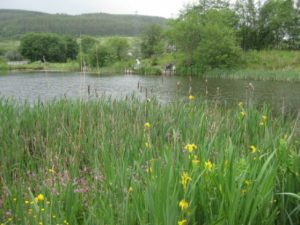 There are ponds for wildlife and fishing. The grass around was full of flowers – orchids, buttercups, ragged robin and iris to name a few. We turned east towards woodland and then north towards Dysgwylfa. We passed a wide waterfall on the river and stopped for lunch later. A sign ‘Caution Pedestrian Crossing’ stood alone in a wide expanse of open land. 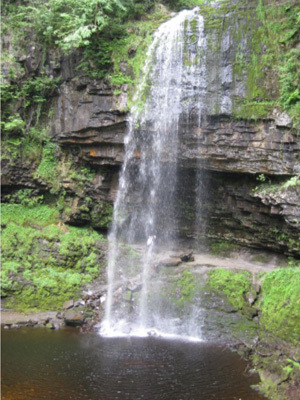 At Sarn Helen (old Roman Road) we turned west and at Tonfildre Farm turned north towards Hendryd falls.